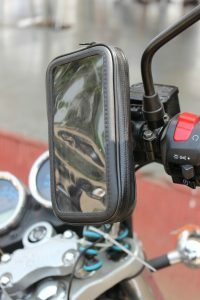 It is very common to see such a contraption on Indian roads. Considering that the usage is in the traffic, the audio is not useful and one needs to rely on the screen. Not really a good idea from safety point of view. Add to this, the glare etc, it takes some effort to read. Secondly, When the navigation is ON, the battery drains faster. Lot of users keep switching navigation ON and OFF to conserve the battery. Thirdly, the audio-guided turn by turn navigation sometimes gets irritating. So, users tend to mute even when in a 4-wheeler. 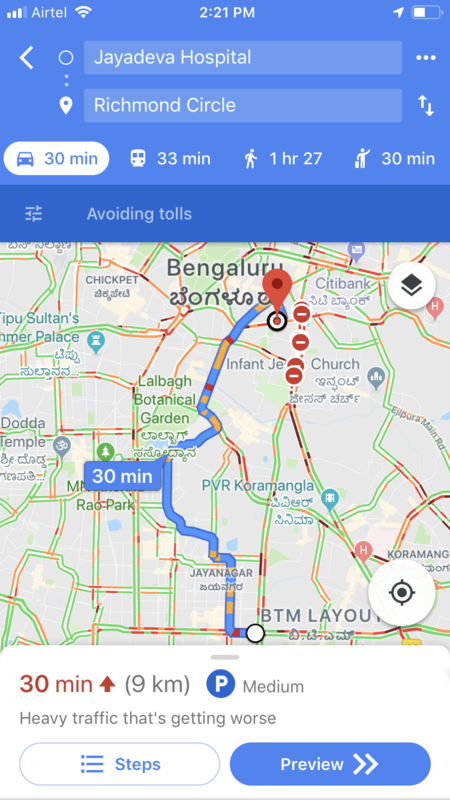 Lets take an example of directions from Lal Bagh, Bangalore to Silk Board junction. While the map shows the places I might have searched or visited sometime back, they are not of much use for this particular case as long as I am not passing through them. Places or landmarks that need to be passed would make more sense, especially when the user is familiar with the city. 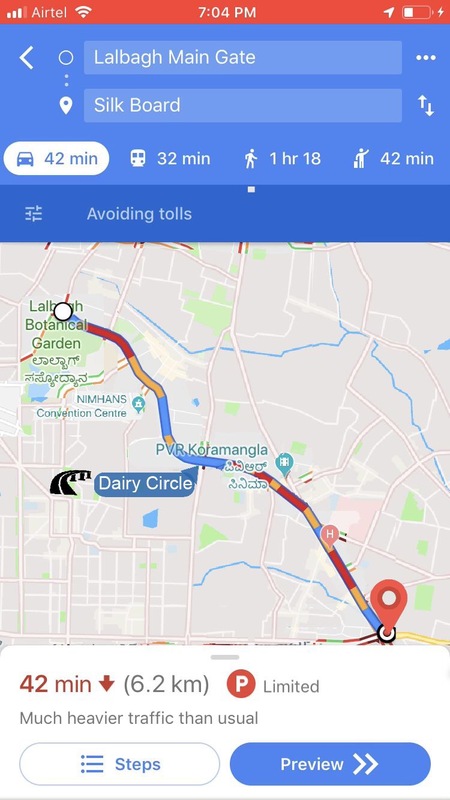 User needs to zoom 3 levels to know that the route is through Dairy circle. Google already has a lot of data of our location history. Check yours here. It already knows the places I frequent and I know, routes I have taken in the past, directions for the routes I needed from Google and much more. Mining this data on the user’s usage pattern on the maps, Google can easily determine how familiar certain user is on a given route. Understanding the user’s knowledge, it can give the routes-in-summary in a personalised manner. Take the Hosur road and pass NIMHANS Convention center. Take the flyover at Dairy circle and continue straight with PVR on your left. The screen also needs to represent only this information. Isn’t this the way your friend who knows about you would tell you the directions. Often times, users are familiar with most part of the route and do not need turn-by-turn navigation for that part. Reach Ashoka Pillar on your usual route via Madhavan park. This can be followed by turn-by-turn navigation for the next steps. With the data that google has about us, it can determine how familiar the user is with certain route with considerable accuracy. 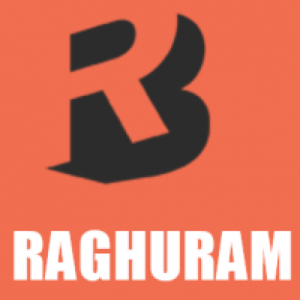 This reduces the cognitive overload of being dependent on the app throughout. This can be further personalised based on what kind of driver one is: one who prefers taking multiple turns in internal roads to reach faster or one who just sticks to the usual route and drives casually or somewhere in between. By focusing on giving the directions with lesser screen time, I believe this will be in the direction of digital well-being, something that both Google and Apple have been talking about.